An activist shouts slogans as she raises a clenched fist during a protest to commemorate International Women's Day in Manila on March 8, 2019. 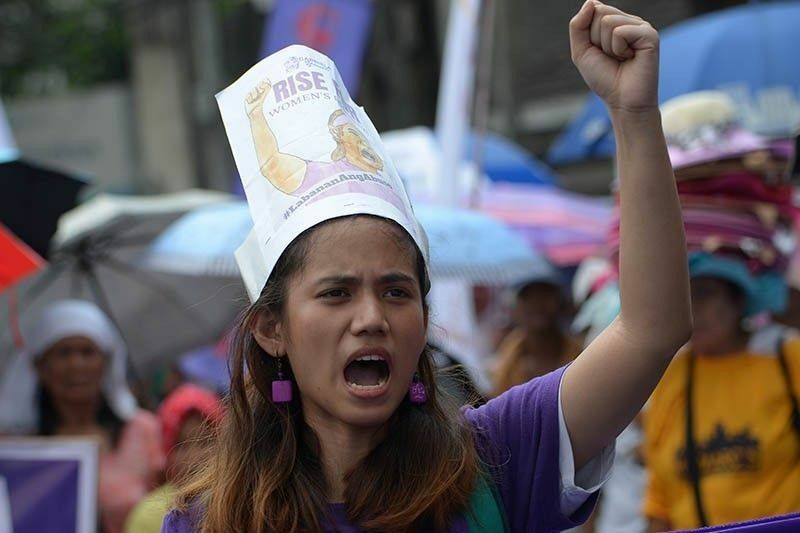 MANILA, Philippines — Women’s rights groups are urging voters to look into leaders who would champion women’s rights in the coming 2019 midterm elections. Women leaders from the Pambansang Koalisyon ng Kababaihan sa Kanayuan, Mawari-based Al-Mujadillah Development Foundation and Oxfam Philippines presented a list of feminist policies must be pushed by political aspirants. “Women’s rights are human rights. It is important to have leaders who are ready and willing to champion the rights of women and girls,” Oxfam in the Philippines Country Director Lot Felizco said. The release of the political agenda they wish for political aspirants coincides with the International Women's Month. The group said that leaders should “challenge unjust structures that perpetuate violence against women and girls,” such as increase unpaid care work burdens, sexual threats, reproductive health and rights and conditions that allow child marriages. “We have yet to see the full implementation of the Responsible Parenthood and Reproductive Law despite its enactment six years ago. The truth is that a lot of women from far-flung communities still have no access to reproductive health services and information,” Amparo Miciano of PKKK was quoted in the media release. The same survey also showed that the Philippines has the highest teenage pregnancy rate in Southeast Asia which poses higher mortality rate at 114 deaths per 100,000 live births. Sittie Mohamad of the Al-Mujadillah Development Foundation also said that child marriage is still practised in the country. “Child marriage is a violation of human rights, and it has negative impacts on the health and development of children, especially girls,” Mohammad added. They also urged political aspirants to address inequality in food supply chains, as small scale farmers who are mostly women often do not earn enough for a decent standard of living. They also asked leaders to lend support to women working for peace in Bangsamoro, especially those who were displaced and forced to leave due to armed conflicts and natural disasters. The whole region of Mindanao is currently under martial law, which will end until 2019. President Rodrigo Duterte placed Mindanao under martial law after terrorists connected with international extremist group Islamic State laid siege to Marawi on May 23, 2017.